The CHICAGO PNEUMATIC Model MS595 4-Stroke Honda Gasoline Powered Upright Compaction Tamper With 6" Wide Trench Foot Are Lighter & More Compact, Yet Deliver CP’s Trademark Performance & Durability. Plus, Every CP Tamper Is Built To Withstand The Toughest Working Conditions While Delivering Powerful Force & Hitting Power. Efficient Shock Absorbers & An Extra-Strong Metal Frame Ensure The Ground Takes The Pounding — Not The Operator. 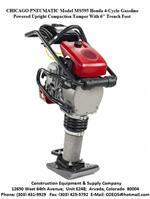 Along With Reliable Performance, They Also Save You Time & Money With Easy Maintenance & Low Fuel Consumption. 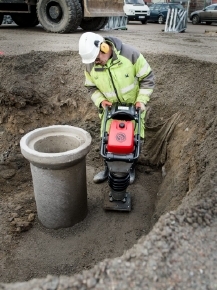 The CHICAGO PNEUMATIC New Model's MS 595 & MS 695 Tampers Range Is Built To Address Productivity & Manoeuvrability Challenges In Compaction Tasks. 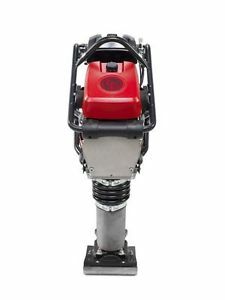 These Most Compact & Lightweight Range Of Tampers Provides Users With Powerful, Highly Manoeuvrable Tampers Plus, The Addition Of A New 6” Plate Model, Alongside The 9 & 11” Models, Allows For Work To Be Carried Out In Smaller, More Enclosed Spaces, Providing Greater Comfort & productivity. 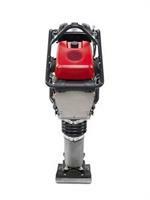 With A Forward-Leaning Design, The Chicago Pneumatic MS 595 & MS 695 Offer Superior Control Of The Tamper, Allowing Users To Walk-Behind While The Momentum Carries The Tamper Forward. Additional Features Such As The Easy-Access Control Lever Enable The Operator To Switch To Idle With Just One Hand. The Compact, Slim Line Design Make The New Tampers Ideal For Narrow Trench Work With The Ability To Tightly Move Around Objects. Protective Hood - Protects Engine & Reduces Noise. This item cannot be shipped by UPS. It will ship by common carrier directly from the factory in North Carolina. For a quote on shipping cost to your location, call (303) 431-9929) or email coeqs@hotmail.com with the Zip Code to which you would like it shipped. Please specify if the delivery location is commercial or residential. Trucking companies charge more to deliver to residential locations. If other options such as “Liftgate” or “Call To Schedule Delivery” is required these may also be an additional charge. Any additional charges will be invoiced to customer & processed against credit card.